Could it be that the Yamaha XJ6 and XJ6 Diversion were just slightly ahead of their time? Naked middleweights are making what appears to be a comeback in the form of Yamaha’s FZ-07 and Suzuki’s new SV650, but in this week’s Church feature, we take a look at a bike that could be considered the predecessor to the FZ-07 – the Yamaha XJ6 (and its half-faired sibling, the XJ6 Diversion). 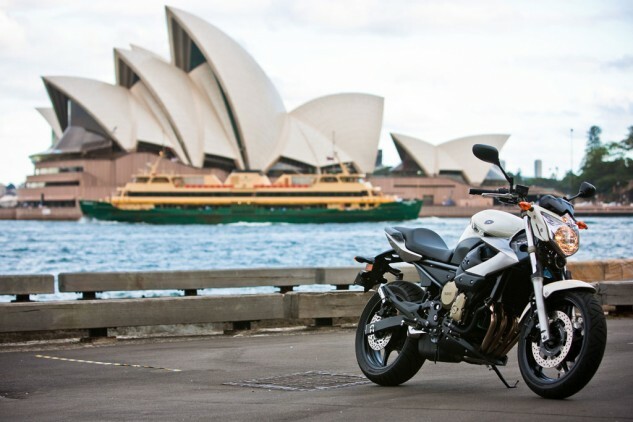 Two bikes that never made it to America, assuming you don’t count the XJ6’s slightly different cousin, the FZ6R. Here, our European Correspondent, Tor Sagen, takes the XJ6 for a spin and tells us all about it. As usual, for more pics, be sure to visit the photo gallery. 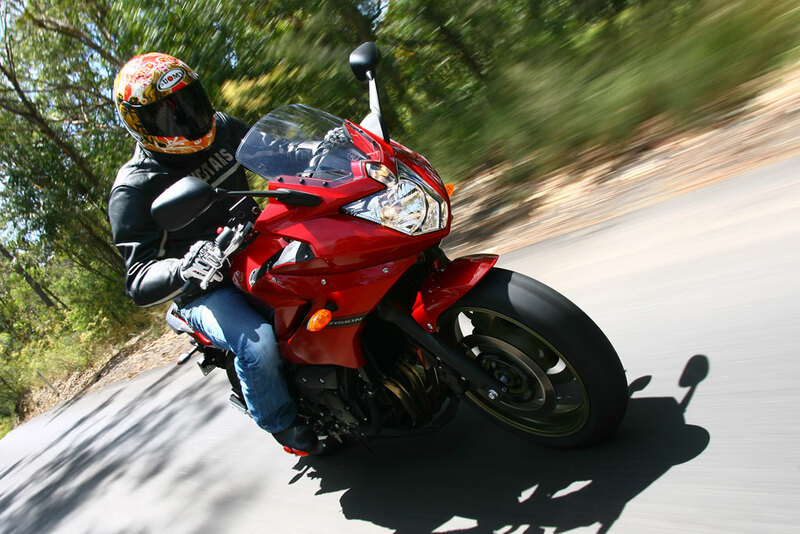 The Diversion is like the VMax, a Ghost from the ’80s brought back to life by Yamaha in 2009. After years of the FZ6 acting as Yamaha’s entry-level model into multi-cylinder motorcycles, the XJ6 is back. Its aims to be easier to ride slow, with less power but more torque in lower revs, and above all – to be even more affordable. After Honda proved there is a market for friendly middleweights with the CBF600, Yamaha has decided to do the same in the new XJ6 series. The concept is pretty much identical to the original Diversion of the 1980s and ’90s, but in all new trim. The XJ6 and XJ6 Diversionare made to be an attractive entry-level model. 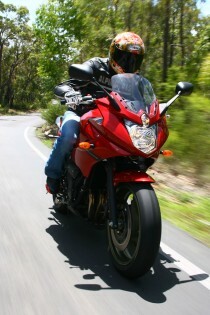 To achieve that, there was a need to be less sharp and edgy than the R6-derived FZ6. The current FZ6 sports around 100 hp, and everything from the engine to the chassis can be traced back to the pre-2006 R6 model. The XJ6 differs in several key areas, such as the detuned FZ6 600cc inline-Four engine, new and simpler chassis and different ergonomics. It’s all done to make the XJ6 as easy to get along with as possible. The XJ6 Diversion differs from its XJ6 sibling by having a half fairing. results in 78 hp at 10,000 rpm with almost 44 ft-lbs of torque at a relatively low 8,500 rpm. Relatively because these small 600cc inline Fours like revs by nature, but the maximum torque figure is reached more than 1,500 rpm earlier than on the more highly strung FZ6. This also means that the XJ6 is easier to launch and few revs are needed for decisive stop-and-go city riding. 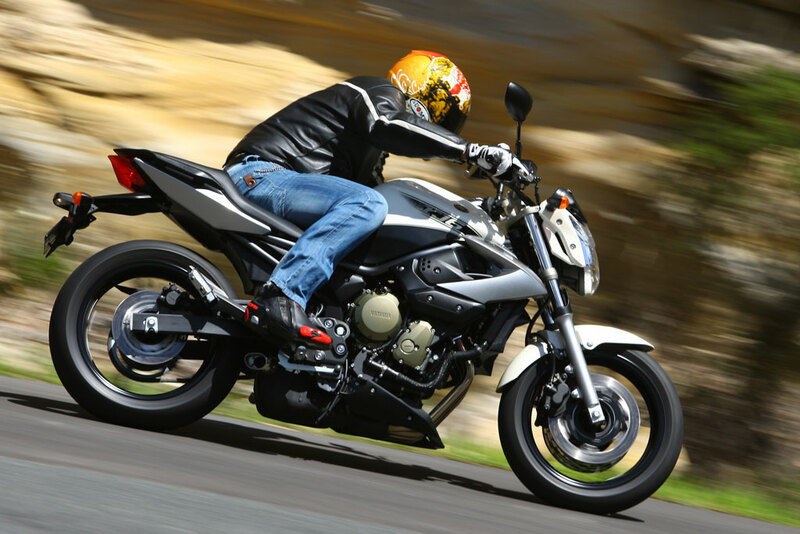 The Yamaha XJ6 also feels more powerful in the lower gears than the Honda. True, it’s been a while since I rode the CBF600, but I do remember that it feels both heavier and softer than my experience on the 2009 Yamaha XJ6. Spec sheets tell us that the curb weight is nearly 18 lbs lower than the CBF. It took me about a minute to get used to the short-rider-biased ergonomics and controls, and then all I had to do was to enjoy the view of the famous Australian city and its beautiful surroundings. Everything from the clutch response to the gearbox feels as smooth as butter. Nothing about the XJ6 is intimidating even in the slightest sense, apart from the aggressive looking headlight. This is essential for someone just getting into bikes or for the more subtle personalities out there. 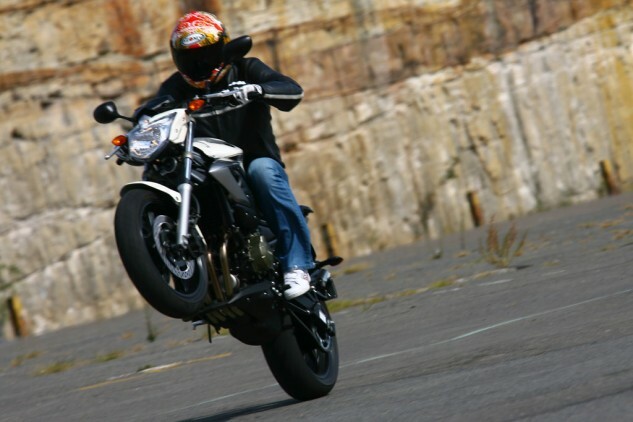 For me, the XJ6 only appeals in the scenario where I couldn’t afford riding anything else. The level of finish and design adds value to what essentially is a budget entry-level motorcycle. I wouldn’t have to even test the XJ6 to see that it offers great value for money. But if I were looking, I would have been happy that I tested first because the XJ6 isn’t all that comfy for the touring part. It took a while to get out of the Sydney city limits and onto some beautiful roads through the bush where we finally rode the Pacific Highway. In the really tight stuff, the suspension and bulk of the 452-lb XJ6 isn’t ideal. It has a tendency to jumps up and down a bit on the budget-minded suspension. The steel tubular frame chassis suits this bike perfectly, but is not quite as light as the aluminum perimeter frame on the FZ6. You lack some of the fine feedback that expert riders are looking for, but that feedback you can’t really utilize fully as a new rider, so why pay extra for it? The XJ6 and XJ6 Diversion have got what it takes to be mildly entertaining out on the open roads but not more, and that fits snugly into the concept I think. First gear easily allows for some air underneath that front tire. One thing worth mentioning about the tires is the fact that Yamaha have opted for a very agile 160-section rear tire. 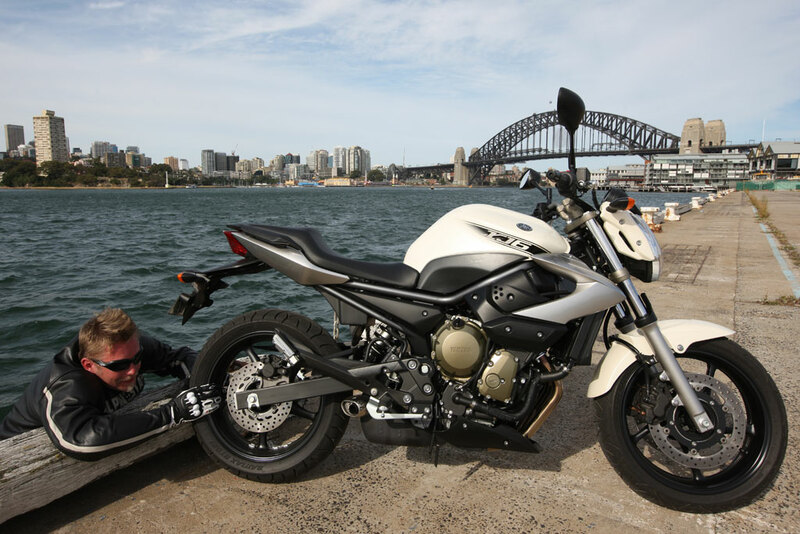 This narrow rear tire (the FZ6 has a 180) makes the bike quicker tipping into corners despite the weight, and easier to make quick maneuvers in the city. The XJ6 Diversion differs from its XJ6 sibling by having a half fairing. That fairing is a well designed and attractive option for those planning to do more touring than city riding. The only major difference riding the two (apart from some extra wind protection) is that the mirrors stick out further. This is good for touring, but I also felt that the mirrors on the naked XJ6 were very good. Contributing to that is the fact that there’s very little vibration from the quiet engine. There’s some high frequency vibration that can be felt both in the handlebars and footpegs, which didn’t bother me much and only appeared after riding many miles. What did start bothering me after a few miles however, was the thinly padded seat. After far too few miles, my bottom started aching. The low seat height made me feel quite big on the bike, and with footpegs touching the ground fairly early you can’t really lower those either. So I found myself trying to push my bottom backwards whilst riding to find some more padding towards the pillion seat to no avail. I can see a great opportunity for aftermarket gel seat makers here. Riding back into Sydney, we were treated to a great photo location in front of the Sydney Harbour Bridge, popularly called the Coat Hanger. Wheelies allowed, it would have been rude not to! Besides, first gear easily allows for some air underneath that front tire. 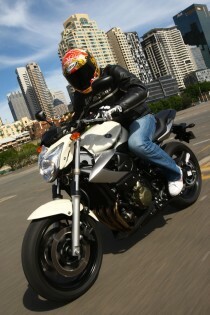 The XJ6 is a great city bike or commuter, and I’d say that this is budget with style. The instruments are easy to read and identical on both XJ6 models. There’s a digital speedo on the left console and an analog rev counter to the right. The XJ6 and XJ6 Diversion are also available with ABS at £350 extra. The XJ6 starts at £4,499 and the XJ6 Diversion at £4,949. Colors for the XJ6 are white, yellow and black, whilst the Diversion is available in red, blue and graphite. Yamaha has now filled a gap in its model range, and overall I think the XJ6 and XJ6Diversion offer great value for the money. The high level of finish makes the bikes look more expensive than they are, which should be well received in the market. 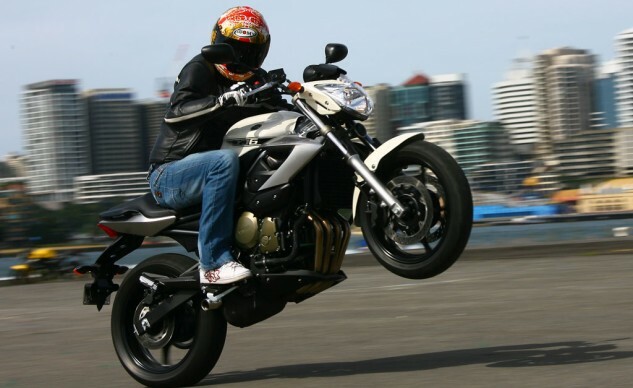 Should you grow tired of it after a year or two, the XJ6 will be easy to shift on the second-hand market too. The only downside for me, were the thinly padded seats, but everything else was what you would expect for a model in this market segment. Diversion is back and it complements Yamaha’s increasing middleweight range nicely. Our writer tries to take the XJ6 back to the briny deep from whence he came.